As the Parti Québécois was crumbling over a private member's bill on an agreement regarding the management of a future Quebec City arena, Premier Jean Charest announced Tuesday the bill will be shelved until the fall session of the National Assembly. Quebec City Mayor Régis Labeaume and Quebecor Media CEO Pierre Karl Péladeau both told the government in hearings last week that getting the bill passed before the end of the current session was crucial to the survival of their agreement – one that would see a $400 million arena built in the provincial capital in the hopes of attracting an NHL team back to the city. The special bill would protect that agreement from legal challenges such as the one former Quebec City director general Denis de Belleval has already launched in Superior Court. In his testimony at the government hearings last week Péladeau went so far as to describe the maintenance of the Sept. 7 expiry date of his agreement with Labeaume as being "incontournable," or essentially a deal-breaker. In a statement Tuesday, Péladeau re-affirmed that sentiment. "In the absence of this legal safeguard, and facing the legal challenge currently before the courts, we feel the ideal conditions for ensuring the return of an NHL hockey team to Quebec City are no longer present and that additional delays could compromise attaining the ultimate goal shared by the great majority of the population of Quebec," he said. Charest had another option regarding the private member's bill sponsored by PQ MNA Agnès Maltais to tack it on to an end of session omnibus bill and use his Liberal majority to have it passed. 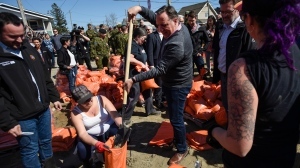 But the premier decided not to use that option, instead choosing to wait until the fall and stating Tuesday that it is up to Labeaume and Péladeau to work within the parameters of the parliamentary agenda. "Mr. Labeaume and Mr. Péladeau will have to determine what their course of action will be," Charest said. "In our case, we're not going to impose closure, an extreme procedural measure, to pass this piece of legislation." The PQ, meanwhile, lost four MNAs in the span of two days and the leadership of Pauline Marois has come under attack over her management of the private member's bill. Party members say they were pressured to support the bill even though they had reservations about supporting an agreement that situated itself in a legal grey area. The agreement was arrived at without a call for tenders, something that is required by Quebec's law on cities and towns, but which Labeaume says is not required under Quebec City's charter. Labeaume made a brief statement to reporters at city hall in Quebec City on Tuesday following Charest's announcement and left without taking questions. "I'm disappointed with the turn of events," Labeaume said. "Obviously someone is trying to stop the momentum of Quebec City. But we're not throwing in the towel. We'll see you in the fall." Péladeau's statement also says that Quebecor will continue negotiating with Quebec City in an attempt to finalize the agreement, but that Tuesday's events will make that process more difficult. "In spite of a result that is not the one we were hoping for, I would like to thank the MNAs that supported this bill and we would like to assure the population we will continue deploying all of the necessary effort to make this project a success and bring an NHL hockey team back to Quebec City," Péladeau said. Charest admitted that the stated plans of Quebec Solidaire MNA Amir Khadir to block adding the bill to the current session and the questions the bill is raising among the population influenced his decision to wait until the fall.